We all like the sound of our music. And there’s nothing like the unique sound of a record. That is the reason why so many are so passionate about it. If you want the best sound out of your records, you need a good cartridge. Audio Technica has a huge line of cartridges. For those really serious audiophiles, there is the moving coil line. Up for review today is their Audio-Technica AT33EV Moving Coil Cartridge. The Audio-Technica AT33EV came in a nice color printed box with specs printed on it. Opening the box revealed a well protected cartridge in a clear plastic box. Also included was the owner’s manual, brush, screws, screwdriver and wires. It included everything you need to install the cartridge on your head. Materials used in the construction appeared to be all metal. Quality of materials used, as well as fit and finish was excellent. It is a flagship product, and it definitely shows. I love the design and build quality if the Audio-Technica AT33EV. Audio-Technica always makes high quality products for the price point. Given its $549 MSRP, I was expecting the same. But after pulling it out and seeing it, I was floored. It’s built like a tank for a cartridge. Just be prepared that it does not come with a head. Attaching it to a spare head I had with the included hardware was simple enough. They provided all of the hardware needed; wires, mini screwdriver, dust brush, and screws in a couple of different sizes. The included manual walked you through the installation process. I was glad to see that it was easy to read and follow. I would expect that those buying this cartridge have experience installing cartridges, but if not just follow the manual. I got it installed and connected to my phono pre-amp, and was ready to go. The sound provide by the Audio-Technica AT33EV was nothing short of stellar! The level of resolution provided was amazing, and I heard details in the music I had not noticed before. Experiencing my music again like it was the first time was a true treasure. I moved from record to record as I fell in love again with the collection. Prince: 1999, the vocals were so silky smooth with excellent texture and timbre. Cymbals were so crisp and clean and the bass was deep, full and with excellent impact and dynamics. Beethoven's 4th Symphony: Strings were extremely clean with excellent resolution of the strings and very dynamic as well. Brass was silky smooth with nice harmonics in the midbass, flute had nice air. And the tympani had excellent impact and low end extension with authority. Sound stage was not just deep and wide, it was holographic. And this was the result of everything I placed on the turntable. Crisp and clean highs with tons of resolution, mids that were silky smooth with excellent harmonics, and midbass and bass with excellent pitch definition, low end definition, dynamics, and authority. Soundstage was wide, deep, and more holographic in nature, with excellent imaging. In the end, I was taken back by the Audio-Technica AT33EV. The sound provided by it was astonishing. The sound quality of modern CD’s and high resolution formats provides amazing resolution. It was so pleasing to not only be able to hear the sound that records are known for, but thanks to the AT33EV, I was also able to hear the resolution the songs provide. You get the best of both worlds! And the build quality is impeccable! 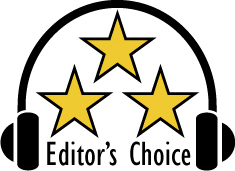 Based on it’s design, features, quality and performance, the Audio-Technica AT33EV Moving Coil Cartridge has earned our Editor’s Choice Award. For more info and complete specs, check out their website at www.audio-technica.com.